Fully Restored Original Art Nouveau Cast Iron Tiled Insert fitted with elegant Orginal Art Noveau tiles. Supplied with a custom made soft white painted Arts and Craft Style Mantelpiece in MDF. Nice stylish well proportioned Period fireplace suitable for lounge or sitting room. 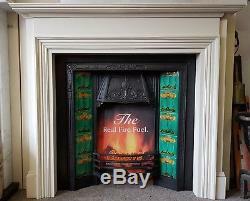 Measurements: Top Shelf Wide 53" (135cm) Height 47" (120cm) Distance between Outside legs 48" (122cm) Inside Opening 36" (91cm) Wide x 36 (91cm) High Cottage Fireplaces is Birmingham's longest established fireplace specialist with over 35 years experience in the industry. We offer a "supply only" or "supply and fit" service within the Birmingham postcode areas. We have a traditional showroom and offer an unrivalled service with all of our engineers being either GAS SAFE or HETAS approved installers. Please send us your postcode for a quote , please note most local deliveries are completed within a week, courier deliveries are normally completed within 14 days. The item "Original Art Nouveau Cast Iron Tiled Inset & Arts and Crafts Style White Mantle" is in sale since Saturday, August 26, 2017. This item is in the category "Antiques\Architectural Antiques\Fireplaces". The seller is "cottage_fireplaces" and is located in birmingham. This item can't be shipped, the buyer must pick up the item.